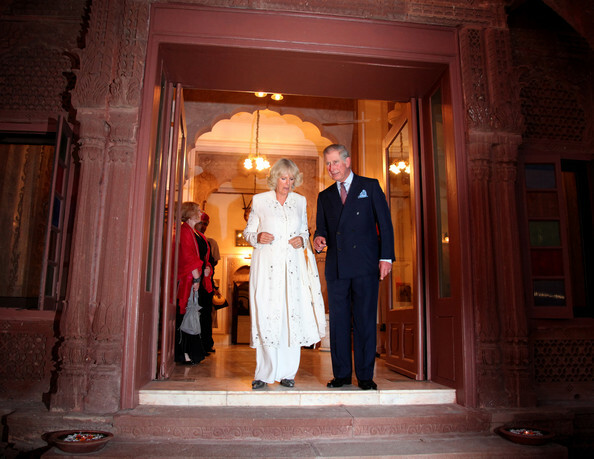 Prince Charles, Prince of Wales (2L) and Camilla, Duchess of Cornwall attend a reception with local dignitaries, British Council representatives & the Maharaja and Maharani of Jodhpur at Bal Samand Palace on the fourth day of a four day visit to India on October 5, 2010 in Jodhpur, India. Along with Camilla, Duchess of Cornwall, Prince Charles, Prince of Wales will jointly undertake a series of engagements throughout India after Prince Charles jointly opened the Commonwealth Games on behalf of The Queen this week. Charles wears his royal blue double breasted suit with a contrasting red tie and light blue handkerchief during his and Camilla's visit to India.